"Happy Xmas" redirects here. For the album, see Happy Xmas (Eric Clapton album). "This Is Christmas" redirects here. For the albums, see This Is Christmas (Luther Vandross album) and This Is Christmas (Katherine Jenkins album). "War Is Over" redirects here. For other uses, see The War Is Over. "Happy Xmas (War Is Over)" was the culmination of more than two years of peace activism undertaken by John Lennon and Yoko Ono that began with the bed-ins they convened in March and May 1969, the first of which took place during their honeymoon. The song's direct antecedent was an international multimedia campaign launched by the couple in December 1969 – at the height of the counterculture movement and its protests against America's involvement in the Vietnam War – that primarily consisted of renting billboard space in 12 major cities around the world for the display of black-and-white posters that declared "WAR IS OVER! If You Want It – Happy Christmas from John & Yoko". Although this particular slogan had previously appeared in the 1968 anti-war songs "The War Is Over" by Phil Ochs and "The Unknown Soldier" by the Doors (which features the refrain "The war is over"), its subsequent use by Lennon and Ono may just be coincidental; there is no evidence to confirm whether or not they were acquainted with these earlier works. Recognising the accessibility and popular appeal that made his 1971 single "Imagine" a commercial success compared to the other songs he had released up to that point, Lennon concluded, "Now I understand what you have to do: Put your political message across with a little honey." He conceived "Happy Xmas (War Is Over)" as a means of elaborating upon the themes of social unity and peaceful change enacted through personal accountability and empowerment that served as the basis of the earlier billboard campaign, trying to convey optimism while avoiding the sentimentality that he felt often characterised Christmas songs. From 1963 to 1969, the Beatles had issued special recordings at Christmas directly to members of their fan club. After the group disbanded in 1970, Lennon was the first former member to release an original Christmas song. "Happy Xmas (War Is Over)" would be followed by George Harrison's "Ding Dong, Ding Dong" (1974), Paul McCartney's "Wonderful Christmastime" (1979) and Ringo Starr's album I Wanna Be Santa Claus (1999). In late October 1971, with not much more than bare-bones melody and half-formed lyrics, Lennon recorded an acoustic guitar demo of "Happy Xmas (War Is Over)" in his rooms at the St. Regis Hotel in New York City, where he and Ono were living at the time. Ono would receive co-writing credit, but the actual extent of her contribution at this initial stage is unclear since she did not participate in the demo, which was atypical of their collaborations. Another demo of the song was made in late October, after the couple had taken an apartment in Greenwich Village. As with his previous two albums, John Lennon/Plastic Ono Band and Imagine (released in the US just several weeks prior), Lennon brought in Phil Spector to help produce. The first recording session was held the evening of Thursday, 28 October, at the Record Plant studio. After the session musicians – some of whom had performed at one time or another as members of the Plastic Ono Band – laid down the basic instrumental backing and overdub tracks, Lennon and Ono added the main vocals. One of the four guitarists present filled in for Klaus Voormann on bass when his flight from Germany was delayed. Ono and the session musicians, including Voormann, recorded the single's B-side, "Listen, the Snow Is Falling", the following day. The Harlem Community Choir – featuring thirty children, most of them four to twelve years of age – came to the studio on the afternoon of 31 October, to record backing vocals for the counter-melody and sing-along chorus. Photographs for the original sleeve cover were also taken during that session by Iain Macmillan. The song begins with spoken Christmas greetings from Ono and Lennon to their children from previous marriages: Ono whispers, "Happy Christmas, Kyoko", then Lennon whispers, "Happy Christmas, Julian". Lyric sheets accompanying the compilation albums Shaved Fish (1975) and The John Lennon Collection (1982) erroneously transcribe this introduction as, "Happy Christmas, Yoko. Happy Christmas, John." When Lennon first played his demo for Phil Spector, the producer remarked that the song's opening line, "So this is Christmas…", was rhythmically identical to the 1961 single "I Love How You Love Me" by the Paris Sisters, which Spector himself had produced. At the recording studio, Lennon instructed the guitarists to incorporate mandolin-style riffs similar to the ones heard in "Try Some, Buy Some", a single that Spector and George Harrison had produced in February 1971 for his wife, Ronnie Spector, formerly of the Ronettes. Spector also included percussion instruments of the sort he used on the 1963 album A Christmas Gift for You. In addition to these reappropriated elements, the chords and melodic structure of "Happy Xmas (War Is Over)" are similar to the traditional English ballad "Skewball", but with a different rhythmic meter, subsequent modulations and a wholly new and different chorus countermelody. The verses of the song are closest in structure to the 1963 rendition (titled "Stewball") by Peter, Paul and Mary. Apple Records released "Happy Xmas (War Is Over)" and "Listen, the Snow Is Falling" in America on 1 December 1971 (Apple 1842). Issued in 7" single format on transparent green vinyl with a card-stock picture sleeve, the pressing bore two label variations, one of which displayed a sequence of five images that showed Lennon's face transforming into Ono's. This sequence was originally featured on the reverse cover of the exhibition catalogue for Ono's career retrospective This Is Not Here, presented in October 1971 at the Everson Museum of Art in Syracuse, New York. A dispute between music publisher Northern Songs and Lennon over publishing rights delayed the release of "Happy Xmas (War Is Over)" in the UK until 24 November 1972 (Apple R 5870). The initial British run was issued in 7" single format on opaque green vinyl with the picture sleeve and variant label, but it sold out quickly and had to be repressed on standard black vinyl. The song's first album appearance was on Shaved Fish, the only compilation of Lennon's solo recordings released during his lifetime. "Happy Xmas" was coupled there with part of a live version of "Give Peace a Chance", performed as the finale of Lennon and Ono's One to One benefit concert on 30 August 1972. Designed by Roy Kohara, the album cover is composed of illustrations by Michael Bryan representing each song on the album; for "Happy Xmas (War Is Over)", the image shows an aeroplane dropping a Christmas ornament instead of a bomb. Over the years, "Happy Xmas (War Is Over)" has been reissued in a number of single formats by Capitol, Geffen and Parlophone, sometimes in conjunction with the release of albums collecting both Lennon's work. It has also appeared on compilations of Christmas songs, notably those from the Now That's What I Call Music! series. A rough mix produced during the first recording session on 28 October 1971 was released in 1998 on the John Lennon Anthology. A music video for "Happy Xmas (War Is Over)" appeared on The John Lennon Video Collection, released on VHS in 1993, corresponding to the 1989 reissue of The John Lennon Collection. It consisted of images from Lennon and Ono's 1969 "War is Over!" billboard campaign and candid photographs of the couple and their son Sean from the late 1970s, interspersed with a boys' choral ensemble singing along with the original Harlem Community Choir vocals. The video was recut, and the song itself remastered, for the 2003 DVD Lennon Legend: The Very Best of John Lennon. The 2003 video is composed of documentary footage, mostly depicting children, from the Vietnam War, in addition to recent scenes from various conflicts in the Horn of Africa, the Bosnian War, the 11 September 2001 attack on New York City, and the US wars in Afghanistan and Iraq. On its US single debut in 1971, "Happy Xmas (War Is Over)" did not meet with much success. This was due to the single's late release, which resulted in limited airplay before Christmas, and a lack of promotion. [note 1] The single peaked at number 36 on the Cash Box Top 100 Singles and number 28 on the Record World Singles Chart, and number 3 on the Billboard Christmas Singles chart. [note 2] The single subsequently re-appeared on the Billboard Christmas charts in 1972, 1983, 1984 and 1985. [note 3] The song appeared at number 32 on the Billboard Hot Adult Contemporary chart for the week ending 6 January 1996. "Happy Xmas (War Is Over)" enjoyed immediate success in Britain when issued there in November 1972. The song peaked at number 4 on the UK Singles Chart and number 10 on the listings compiled by Melody Maker. Since then, it has re-entered the UK Singles Chart nine more times. The most notable of these instances occurred immediately following Lennon's death on 8 December 1980. The single peaked at number 2 – behind another reissued Lennon single, "Imagine" – and remained on the chart for nine weeks. Between December 1972 and February 1973, the song entered the top ten in Australia, Belgium, Denmark, France, Ireland, the Netherlands, Norway and Singapore. In recent decades, "Happy Xmas (War Is Over)" has gained a higher profile in the cultural mainstream due to an increasing proliferation of cover versions by other musical artists, most having been recorded during the last ten years[when?]. Among these, two have entered the Billboard charts, both of them in the same year. The first was released on 17 October 2006 by Canadian singer-songwriter Sarah McLachlan along with her album Wintersong, which was the best-selling Christmas album of the year and a Grammy nominee. It features backing vocals from the Children's and Youth Choirs of the Music Outreach Program at the Sarah McLachlan School of Music in Vancouver, British Columbia. Entering the Billboard Adult Contemporary chart at number 22 on the week ending 9 December 2006, it climbed to a peak position of number 5, four weeks later. The second was released 12 December 2006 by American rock band The Fray as a digital download. It debuted at number 50 on the Billboard Hot 100 and number 41 on the Pop 100 on the week ending 31 December 2006, but stayed on the respective charts for only one more week. Some of the earliest cover versions of "Happy Xmas (War Is Over)" appear on holiday albums released by major pop singers, such as I Still Believe in Santa Claus (1990) by Andy Williams, The Christmas Album (1992) by Neil Diamond, A Very Special Season (1994) by Diana Ross, Christmas Island (1996) by Jimmy Buffett, and These Are Special Times (1998) by Celine Dion. This trend has continued with Save This Christmas for Me (2001) by Johnny Logan, Christmas Is Almost Here (2002) by Carly Simon, December (2003) by the Moody Blues, It's Christmas, Of Course (2007) by Darlene Love, A Winter Symphony (2008) by Sarah Brightman, Not So Silent Night...Christmas with REO Speedwagon (2009) by REO Speedwagon, Happy X-Mas (War Is Over) (2010) by Daniel Powter, Happy Christmas (2010) by Jessica Simpson, Hear the Bells (2011) by Vanessa Carlton, "Ugly Sweater Party" by the a cappella group Six Appeal, Christmas in Tahoe (2015) by Train, Laura Xmas (2016) by Laura Pausini and An Echosmith Christmas (2017) by Echosmith. Also typical are covers included on seasonal compilation albums that contain songs from various artists, such as the versions on The Coolest Christmas (1994) by The Alarm; Merry Axemas: A Guitar Christmas (1997) by Tomoyasu Hotei; Christma-ska (1998) by the Toasters; It's All Bells – Jingle All The Way (2002) by Damien Rice; Maybe This Christmas (2002) by Sense Field; Pop Idol: The Idols – Xmas Factor (2003) by the top ten finalists from the second series of Pop Idol; Maybe This Christmas Tree (2004) by the Polyphonic Spree; Happy Holidays from Drive-Thru Records (2004) by An Angle; Taste of Christmas (2005) by Street Drum Corps and Bert McCracken; We Wish You a Metal Xmas and a Headbanging New Year (2008) by Tommy Shaw, Steve Lukather, Marco Mendoza, and Kenny Aronoff; Christmas Chants (2008) by Gregorian; Happy Christmas Vol. 5 (2010) by Sent By Ravens; The Warmest Gift (2011) by J-Min; and Glee: The Music, The Christmas Album Volume 3 (2012) by Cory Monteith. Other notable covers of "Happy Xmas (War Is Over)" include a 1991 version on the album Standards by The Alarm, a 1994 in-concert performance by Melissa Etheridge, the 2002 version by South African band Toxic Shame the 2007 single release by Maroon 5, and a 2009 version by mash-up band Beatallica on the album Winter Plunderband. On 13 December 2012, Sean Lennon performed the song with gospel singer Mavis Staples, Jeff Tweedy of the band Wilco, and the Harlem Gospel Choir on the Comedy Central program The Colbert Report. This version was made available for purchase on the music download site iTunes, and proceeds were donated to Hurricane Sandy disaster relief. During John Lennon 75th Birthday Concert Sheryl Crow, Aloe Blacc, and Peter Frampton covered the song with a children's chorus from The Stuttering Association for the Youth. On 14 December 2018, Miley Cyrus and Mark Ronson recorded a cover version of the song featuring Lennon's son, Sean Ono Lennon. The three of them performed their cover on the 15 December 2018 episode of Saturday Night Live, where Ronson and Cyrus were booked as the episodes musical guests. ^ During this era, radio stations were less inclined to interrupt regular programming with Christmas music and new Christmas songs were slow to gain acceptance. "Happy Xmas" was the second-highest charting Christmas single in the 1970s in the US, behind the Eagles' version of "Please Come Home for Christmas". ^ In years when Billboard published a Christmas Singles chart, Christmas singles were not listed on the Hot 100 chart. ^ Billboard published a Christmas Singles chart from 1963 to 1972, and from 1983 to 1985. ^ Kruse, pp. 15–17, 22–24. ^ Blaney, pp. 96, 101. ^ a b Jackson, p. 49. ^ a b Lynskey, p. 137. ^ a b c d Blaney, p. 101. ^ a b c Jackson, p. 50. ^ Blaney, pp. 93, 95. ^ a b Blaney, p. 96. ^ Spizer, pp. 109, 110. ^ a b Madinger and Easter, p. 66. ^ Hannigan, Ingrid (22 December 1973). "Christmas Releases Still Late; Few Top Names Add to Apathy". Billboard. New York: Billboard Publications, Inc.
^ Whitburn, Joel (2004). Christmas in the Charts 1920–2004. Menomenee Falls, Wisconsin: Record Research Inc. p. 75. ISBN 978-0-89820-161-1. ^ a b c Whitburn, Joel (2015). The Comparison Book. Menonomee Falls, Wisconsin: Record Research Inc. p. 299. ISBN 978-0-89820-213-7. ^ White, T., ed., p. 84. ^ a b c d e f g h i j k l m n o p q r s t "happy-xmas-(war-is-over) > Full Official Chart History". Official Charts Company. ^ Castleman and Podrazik, p. 342. ^ Werde, ed., p. 49. ^ Werde, ed., pp. 48, 50. ^ "Ultratop.be – John & Yoko / The Plastic Ono Band with The Harlem Community Choir – Happy Xmas (War Is Over)" (in Dutch). Ultratop 50. ^ "The Plastic Ono Band with The Harlem Community Choir/?type=single Musicline.de – John & Yoko / The Plastic Ono Band with The Harlem Community Choir Single-Chartverfolgung" (in German). Media Control Charts. PhonoNet GmbH. ^ a b "Nederlandse Top 40 – John & Yoko / The Plastic Ono Band with The Harlem Community Choir" (in Dutch). Dutch Top 40. 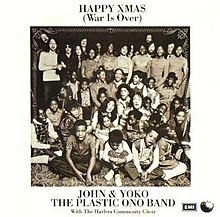 ^ "Norwegiancharts.com – John & Yoko / The Plastic Ono Band with The Harlem Community Choir – Happy Xmas (War Is Over)". VG-lista. ^ "Dutchcharts.nl – John & Yoko / The Plastic Ono Band with The Harlem Community Choir – Happy Xmas (War Is Over)" (in Dutch). Single Top 100. Retrieved 29 December 2018. ^ "John Lennon Chart History (Holiday Airplay)". Billboard. ^ a b c d "Swedishcharts.com – John & Yoko / The Plastic Ono Band with The Harlem Community Choir – Happy Xmas (War Is Over)". Singles Top 100. ^ a b "Swisscharts.com – John & Yoko / The Plastic Ono Band with The Harlem Community Choir – Happy Xmas (War Is Over)". Swiss Singles Chart. ^ "Austriancharts.at – John & Yoko / The Plastic Ono Band with The Harlem Community Choir – Happy Xmas (War Is Over)" (in German). Ö3 Austria Top 40. ^ "SloTop50: Slovenian official singles weekly chart" (in Slovenian). SloTop50. Retrieved 22 December 2013. ^ "Track Top-40 Uge 49, 2017". Hitlisten. Retrieved 13 December 2017. ^ "Offiziellecharts.de – John & Yoko / The Plastic Ono Band with The Harlem Community Choir – Happy Xmas (War Is Over)". GfK Entertainment Charts. Retrieved 29 December 2017. ^ "NZ Top 40 Singles Chart". Recorded Music NZ. 1 January 2018. Retrieved 29 December 2017. ^ "Listy bestsellerów, wyróżnienia :: Związek Producentów Audio-Video". Polish Airplay Top 100. Retrieved 2 January 2018. ^ "SloTop50 – Slovenian official singles chart". slotop50.si. Retrieved 29 August 2018. ^ "Swisscharts.com – John & Yoko / The Plastic Ono Band with The Harlem Community Choir – Happy Xmas (War Is Over)". Swiss Singles Chart. Retrieved 31 December 2017. ^ "ARIA Australian Top 50 Singles". Australian Recording Industry Association. 31 December 2018. Retrieved 29 December 2018. ^ "Austriancharts.at – John & Yoko / The Plastic Ono Band with The Harlem Community Choir – Happy Xmas (War Is Over)" (in German). Ö3 Austria Top 40. Retrieved 3 January 2019. ^ "John Lennon Chart History (Canadian Hot 100)". Billboard. Retrieved 1 January 2019. ^ "ČNS IFPI" (in Czech). Hitparáda – Radio Top 100 Oficiální. IFPI Czech Republic. Note: Change the chart to CZ – RADIO – TOP 100 and insert 201851 into search. Retrieved January 15, 2019. ^ "Europe Official Top 100". 1 January 2019. Retrieved 15 January 2019. ^ "Top Singles (téléchargement + streaming)". Syndicat National de l'édition Phonographique. 28 December 2018. Retrieved 12 January 2019. ^ "Offiziellecharts.de – John & Yoko / The Plastic Ono Band with The Harlem Community Choir – Happy Xmas (War Is Over)". GfK Entertainment Charts. Retrieved 28 December 2018. ^ "Top Singoli – Classifica settimanale WK 52" (in Italian). Federazione Industria Musicale Italiana. Retrieved 29 December 2018. ^ "Dutchcharts.nl – John & Yoko / The Plastic Ono Band with The Harlem Community Choir – Happy Xmas (War Is Over)" (in Dutch). Single Top 100. Retrieved January 15, 2019. ^ "VG-lista – Topp 20 Single uke 52, 2018". VG-lista. Retrieved 15 January 2019. ^ "Listy bestsellerów, wyróżnienia :: Związek Producentów Audio-Video". Polish Airplay Top 100. Retrieved 31 December 2018. ^ "Portuguesecharts.com – John & Yoko / The Plastic Ono Band with The Harlem Community Choir – Happy Xmas (War Is Over)". AFP Top 100 Singles. Retrieved 4 January 2019. ^ "ČNS IFPI" (in Slovak). Hitparáda – Radio Top 100 Oficiálna. IFPI Czech Republic. Note: insert 201851 into search. Retrieved January 15, 2019. ^ "Top 100 Canciones – Semana 52: del 21.12.2018 al 27.12.2018" (in Spanish). Productores de Música de España. Retrieved 4 January 2019. ^ "Swisscharts.com – John & Yoko / The Plastic Ono Band with The Harlem Community Choir – Happy Xmas (War Is Over)". Swiss Singles Chart. Retrieved 31 December 2018. ^ "John Lennon Chart History (Hot 100)". Billboard. Retrieved 1 January 2019. ^ "John & Yoko and the Plastic Ono Band "Happy Xmas (War Is Over)"". IFPI Denmark. 19 December 2017. Retrieved 3 January 2018. ^ Copsey, Rob (19 September 2017). "The UK's Official Chart 'millionaires' revealed". Official Charts Company. Retrieved 4 September 2018. ^ "British single certifications – John & Yoko/Plastic Ono Band – Happy Xmas (War Is Over)". British Phonographic Industry. Select singles in the Format field. Select Silver in the Certification field. Type Happy Xmas (War Is Over) in the "Search BPI Awards" field and then press Enter. Badman, Keith (2001). The Beatles Diary Volume 2: After the Break-Up 1970–2001. London: Omnibus Press. ISBN 978-0-7119-8307-6. Retrieved 11 April 2013. "Pogues Track Wins Christmas Poll". BBC News: Entertainment. London, UK: BBC. 16 December 2004. Retrieved 19 December 2012. "Happy Xmas (War Is Over)". The Beatles Bible. Cardiff, Wales, UK: Joe Pepper. 2010. Retrieved 19 December 2012. Blaney, John (June 2005). John Lennon: Listen to This Book. London, UK: Paper Jukebox. ISBN 978-0-9544528-1-0. Retrieved 19 December 2012. "Cash Box Top 100 Singles: The week ending 1 January 1972". "Cash Box" Archives: The Legendary "Cash Box" Magazine Charts. Ridgeway, SC: Cash Box Magazine. 2012. Archived from the original on 13 December 2010. Retrieved 19 December 2012. Christman, Ed (3 November 2007). Werde, Bill (ed.). "Jingle All the Way: Holiday Cheer". Billboard. New York City, NY: Nielsen Business Media. 119 (44): 32. ISSN 0006-2510. Retrieved 19 December 2012. De Zutter, Bastien (23 November 2012). "Song: Happy Xmas (War Is Over)". Second Hand Songs. Brussels, BE. Retrieved 19 December 2012. Gilmore, Mikal (15 December 2005). Dana, Will (ed.). "Lennon Lives Forever". Rolling Stone. New York City, NY: Jann S. Wenner (989): 56–66. ISSN 0035-791X. Greene, Andy (30 November 2011). "Readers' Poll: The Best Christmas Songs of All Time". Rolling Stone. New York City, NY: Jann S. Wenner. Retrieved 19 December 2012. Holdsworth, Sam, ed. (21 December 1985). "1985 Christmas Hits". Billboard. New York City, NY: Billboard Publications. 97 (51): 57. ISSN 0006-2510. Retrieved 19 December 2012. Jackson, Andrew Grant (July 2012). Still the Greatest: The Essential Songs of The Beatles' Solo Careers. Lanham, MD: Scarecrow Press. ISBN 978-0-8108-8222-5. Retrieved 19 December 2012. Kruse, Robert J. (December 2009). "Geographies of John and Yoko's 1969 Campaign for Peace—An Intersection of Celebrity, Space, Art, and Activism". In Johansson, Ola & Bell, Thomas L (eds.). Sound, Society and the Geography of Popular Music. Farnham, Surrey, UK: Ashgate Publishing. pp. 11–32. ISBN 978-0-7546-7577-8. Retrieved 19 December 2012. Lynskey, Dorian (April 2011). "Chapter 8: Plastic Ono Band, 'Give Peace a Chance'". 33 Revolutions per Minute: A History of Protest Songs, from Billie Holiday to Green Day. New York City, NY: Ecco Press. pp. 126–142. ISBN 978-0-06-167015-2. Retrieved 19 December 2012. "Artists–John Lennon: Singles". Official Charts Company. London, UK: The Official UK Charts Company. 2012. Retrieved 19 December 2012. Sheff, David (December 2000) . All We Are Saying: The Last Major Interview with John Lennon and Yoko Ono. New York City, NY: St. Martin's Griffin. ISBN 978-0-312-25464-3. Retrieved 19 December 2012. Tillekens, Ger (September 1998). Knot, Hans (ed.). "Baroque and Folk and... John Lennon: Some folk and classical elements in the songs of John Lennon". Soundscapes: Journal on Media Culture. Groningen, NL. 1 (Summer 1998). ISSN 1567-7745. Retrieved 19 December 2012. Werde, Bill, ed. (6 January 2007). "Billboard Charts". Billboard. New York City, NY: Nielsen Business Media. 119 (1): 43–62. ISSN 0006-2510. Retrieved 19 December 2012. Whitburn, Joel (June 2004). Joel Whitburn's Top Pop Singles 1955–2002 (10th ed.). Menomonee Falls, WI: Record Research. ISBN 978-0-89820-155-0. White, Adam, ed. (22 December 1984). "1984 Christmas Hits". Billboard. New York City, NY: Billboard Publications. 96 (51): 8. ISSN 0006-2510. Retrieved 19 December 2012. White, Timothy, ed. (6 January 1996). "Hot Adult Contemporary". Billboard. New York City, NY: Billboard Music Group. 108 (1): 84. ISSN 0006-2510. Wiener, Jon (January 1991). Come Together: John Lennon in His Time. Champaign, IL: University of Illinois Press. ISBN 978-0-252-06131-8. Retrieved 19 December 2012. Williams, Richard (13 December 2011). "John Lennon: "I was sick of 'White Christmas'" – A classic interview from the vaults". Guardian Culture: Music—From Rock's Backpages. London, UK: The Guardian. Retrieved 19 December 2012. Zhito, Lee & Ackerman, Paul, eds. (25 December 1971). "Best Bets for Christmas". Billboard. Los Angeles, CA: Billboard Publications. 83 (52): 49. ISSN 0006-2510. Retrieved 19 December 2012. Zhito, Lee & Ackerman, Paul, eds. (23 December 1972). "Best Bets for Christmas". Billboard. Los Angeles, CA: Billboard Publications. 84 (52): 4. ISSN 0006-2510. Retrieved 19 December 2012.